Like all sports, rock climbing requires an investment of your time and energy to learn new skills. If you want to continue growing as an athlete, rock climbing exercises can be self-challenging and help you develop strength and fitness. As your balance and efficiency improve over time, your technique and strength will allow you to climb overhanging, near-vertical, or vertical rocks. Rock climbing requires you to accelerate up a wall with your legs rather than pulling with your arms. You need a strong torso and core, and if you have excellent efficiency, it means you have a solid strength-to-weight ratio. The sport involves strength training, but not all exercises are climbing specific. Take a look at the following rock climbing exercises for beginners to help you gain precision and power. Weekly cardio workout: As suggested, perform cardio workouts two days per week, beginning and ending each with static exercises to keep your muscles loose. Work out between 30 and 60 minutes. Interval training: Interval training is when you implement 30 to 60 seconds of high-intensity cardio followed by a lighter workout for one to two minutes. You can repeat intervals for 20 to 40 minutes while remembering to dynamic stretch before and after. Weekly strength training workout: Schedule three days each week to strength training for rock climbing with three to four sets of each workout. Suggested exercises include the lateral pillar bridge with lateral pull, lateral pillar bridge with an overhead press with a band, pull-ups, pushups with a single arm row and the dyno step jump to squat landing. If you’ve never lifted weights, seek help from a trainer so you can master the proper form. If you start with bad techniques, they can lead to injuries. Bouldering forms practical strength in your fingers and helps you develop technical skills. It's important to focus on hard moves and to target varying grip positions. Try to climb the chosen problem several times and rest five minutes for intense grips and three for small obstacles. Positions you can try are the crimp, pinch, open hand and two finger pocket. Train for 30 to 90 minutes. A fingerboard training tool is what you can use for multiple finger grips and positions. It allows you to target definite grip positions at recurring high-intensity contractions. Repeaters let you hang with both hands on identical blocks so you can train your weakest grip first. It's suggested to perform 10 hangs lasting about five seconds while taking a rest between. Highly intense hangs are effective, especially when you add weight to your waist for more resistance. Stretch to recover and then move to next grip position. Using a 10 to 20-pound weight belt, determine the number of attempts you want to start with. Most begin at five and build to 10 and 15 as you achieve strength. You activate the exercise by choosing a nontechnical overhanging problem that will be doable yet strenuous. Perform the climb about three times with the belt. Rest three minutes for short attempts and five for long. Once you complete the first round, move to a different exercise that targets another grip and repeat the steps. For the feet-on lunging exercise, go to an indoor wall overhanging about five to 25 degrees past the vertical line. The steeper the wall becomes, the trickier it will be, so you can also choose one with various sized hand and footholds. Place two footholds one foot off the ground. Then, take two handholds and put one ahead of your face and the other two feet above the first. Begin by balancing your weight on the footholds and clasp the hold in front of your face. Hold your other hand behind back and lunge up and down. Between both handholds and using one hand, pull your body toward the rock wall and thrust up to the top hold. In one smooth motion, fall back down to the initial hold. It's important not to pause so you can explode back up. Do eight to 12 handholds then switch to your other arm. Execute two or three sets of each hand by concentrating on speed rather than the volume of repetitions. Campus training uses a hand-over-hand, laddering motion with no support from your feet. With the precise dynamic movements of this exercise, you begin at the first rung of your campus board. Hand over hand, pull yourself up the board using alternating rungs, attempting to ascend as fast as possible. Once you reach the top, match your hand together then descend. Do six to 12 hand moves and increase the level of difficulty by skipping rungs each time. Rock climbing exercises are essential to not only increase your strength as an athlete but to also decrease your risk of injury. 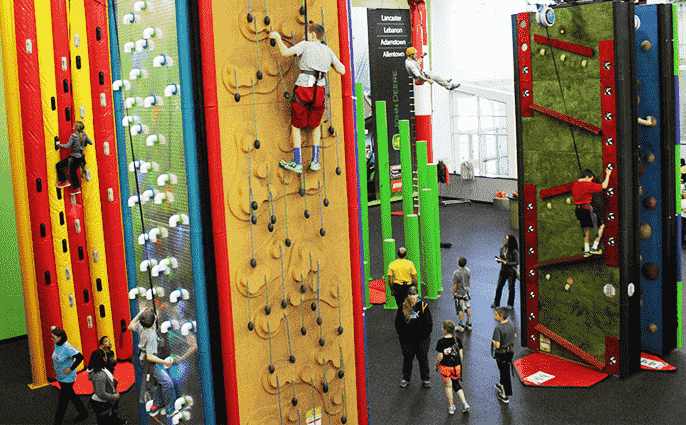 The Spooky Nook Sports climbing gym has walls reaching up to 30 feet with different levels of difficulty. The premier center also has a free-standing boulder with unique features and angles. You can check out new routes each time you come, along with our crack climbing segment. 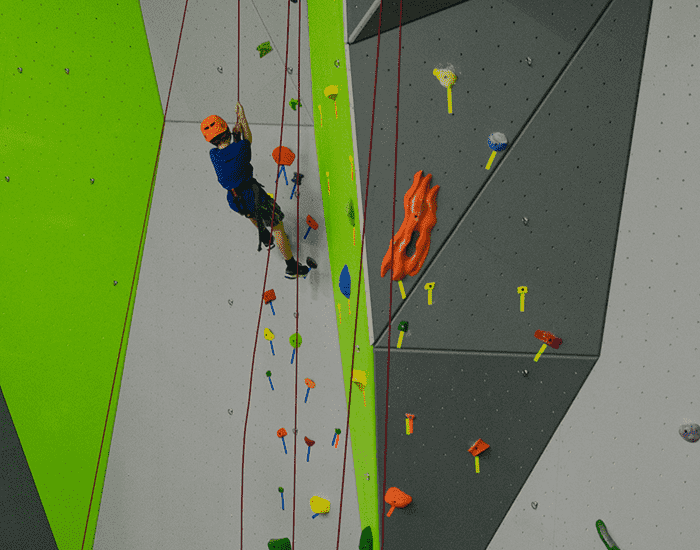 Whether you are a beginner or have a few years of experience, our rock climbing walls will help you train.